The words of the Angel Gabriel to Mary, “Hail, full of grace” (Lk 1: 28), resonate in a unique way in this Shrine, a privileged place for contemplating the mystery of the Incarnation of the Son of God. Indeed, here are conserved the walls that, according to tradition, come from Nazareth, where the Holy Virgin pronounced her “yes,” becoming the mother of Jesus. Since the place named the “home of Mary” became a venerated and beloved presence on this hill, the Mother of God has never ceased to obtain spiritual benefits in those who, with faith and devotion, come here to pause in prayer. Among these people, today I include myself, and I thank God Who granted this to me precisely on the day of the Annunciation. I greet the Authorities, with gratitude for their welcome and collaboration. I greet Msgr. Fabio Dal Cin, who has made himself the interpreter of the sentiments of you all. With him I also greet the other prelates, the priests, the consecrated persons, with a special thought for the Capuchin Fathers, who are entrusted with the custodianship of this distinguished shrine so dear to the Italian people. They are good, these Capuchins! Always in the confessional, always, to the point that you enter the Shrine and there is always at least one of them there, or two or three or four, but always, during the day and at the end of the day, and this is a difficult job. They are good and I thank them especially for this precious ministry of the confessional, continued throughout the day. Thank you! And to all of you, citizens of Loreto and pilgrims gathered here, I extend my cordial greeting. Many people come to this oasis of silence and piety, from Italy and from all over the world, to draw strength and hope. I am thinking in particular of young people, families and the sick. The Holy House is the home of the young, because here the Virgin Mary, the young woman full of grace, continues to speak to the new generations, accompanying each person in the search for his or her own vocation. This is why I wanted to sign here the Apostolic Exhortation, fruit of the Synod dedicated to young people. It is titled “Christus vivit -- Christ lives.” In the event of the Annunciation the dynamic of the vocation appears, expressed in the three moments that marked the Synod: 1) listening to the Word – plan of God; 2) discernment; and 3) decision. The first moment, that of listening, is manifested by those words of the Angel: “Do not be afraid, Mary; for you have found favour with God … you will conceive in your womb and bear a son, and you shall call His name Jesus” (vv. 30-31). It is always God Who takes the initiative to call to His following. It is God Who takes the initiative: He always precedes us, He precedes, He sets the way in our life. The call to faith and to a consistent path of Christian life or a special consecrated life is God’s discreet but powerful irruption in the life of a young person, to offer His love to that person as a gift. It is necessary to be ready and willing to listen to and welcome God's voice, which is not recognized in noise and agitation. His plan for our personal and social life is not perceived by staying on the surface, but by descending to a deeper level, where moral and spiritual forces act. It is there that Mary invites the young to descend and to be in tune with God’s action. The second moment typical of every vocation is discernment, expressed in Mary’s words: “How will this be?” (v. 34). Mary does not doubt: her question is not a lack of faith, rather it expresses precisely her desire to discover the “surprises” of God. She is attentive to grasping all the demands of God’s plan for her life, to know it in all its facets, to make her own collaboration more responsible and more complete. It is the attitude proper to the disciple: every human collaboration in God’s gratuitous initiative must be inspired by a deepening of one’s own capacities and attitudes, linked with the awareness that it is always God Who gives, Who acts; in this way even the poverty and smallness of those whom the Lord calls to follow Him on the way of the Gospel is transformed into the richness of the manifestation of the Lord and in the strength of the Almighty. Decision is the third step that characterizes every Christian vocation, and is made explicit in Mary’s answer to the angel: “Let it be to me according to Your word” (v. 38). Her “yes” to God’s plan of salvation, put into effect by means of the Incarnation, is the entrustment to Him of her entire life. It is the “yes” of full trust and total availability to God’s will. Mary is the model of every vocation and the inspirer of all vocational pastoral care: the young who are seeking or questioning themselves about their future can find in Mary the one who helps them to discern God’s plan for them and the strength to adhere to it. I think of Loreto as a privileged place where the young can come in search of their own vocation, in the school of Mary! A spiritual pole in the service of vocational pastoral ministry. I hope, therefore, that the “John Paul II” Centre may be re-launched in the service of the Church in Italy and at international level, consistent with the indications that emerged from the Synod. A place where the young and their educators can feel they are welcomed, accompanied and helped to discern. 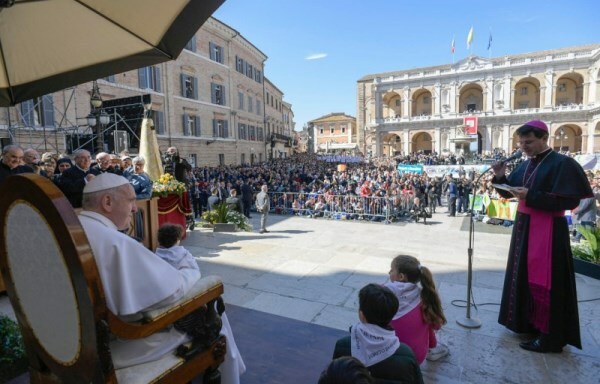 For this, I also warmly ask the Capuchin Friars for an additional service: the service of extending the opening hours of the Basilica and of the Holy House during the late evening and also the beginning of the night, when there are groups of young people who come to pray and to discern their vocation. The Shrine of the Holy House of Loreto, also as a result of its geographical location in the centre of the peninsula, lends itself to becoming, for the Church that is in Italy, a place to propose a continuation of the world meetings of young people and of the family. Indeed, it is necessary for the enthusiasm of the preparation and celebration of these events to correspond to their pastoral implementation, which gives flesh to the richness of the contact, through proposals for deepening, prayer and sharing. The House of Mary is also the house of the family. In the delicate situation of today’s world, the family based on the marriage between a man and a woman takes on an essential importance and mission. It is necessary to rediscover the plan drawn up by God for the family, to reiterate its greatness and irreplaceability in the service of life and of society. In the house of Nazareth, Mary lived the multiplicity of family relations as daughter, betrothed, wife and mother. For this reason every family, in its different members, finds here acceptance and inspiration to live its own identity. The domestic experience of the Holy Virgin indicates that family and young people cannot be two parallel sectors of the pastoral care of our communities, but they must walk closely together, because very often young people are what a family has given them in period of their growth. This perspective recomposes in a unitary fashion a vocational ministry attentive to expressing the face of Jesus in its many aspects, as priest, spouse and pastor. The House of Mary is the house of the sick. Here those who suffer in the body and in the spirit may find welcome, and the Mother brings to all the Lord’s mercy from generation to generation. Sickness wounds the family, and the sick must be accepted within the family. Please, do not surrender to that throwaway culture that is proposed by the many ideological colonisations that attack us today. The house and the family are the first cure for the sick, in loving them, supporting them, encouraging them and taking care of them. 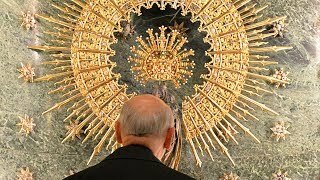 This is why the Shrine of the Holy House is the symbol of every welcoming home and shrine of the sick. From here I send to all of these, everywhere in the world, an affectionate thought and I say to them: you are at the centre of Christ’s work, because you share and carry behind Him the cross of every day in the most concrete way. Your suffering can become a decisive collaboration for the advent of the Kingdom of God. Dear brothers and sisters! To you and to those who are connected to this Shrine, God, through Mary, entrusts a mission in this time of ours: to bring the Gospel of peace and life to our contemporaries who are often distracted, occupied with worldly interests or immersed in a climate of spiritual aridity. There is a need for simple and wise, humble and courageous, poor and generous people. In short, people who, following the school of Mary, welcome without reserve the Gospel in their own life. In this way, through the holiness of the people of God, from this place testimonies of holiness in every state of life will continue to spread through Italy, Europe and the world, to renew the Church and inspire society with the leaven of the Kingdom of God. May the Holy Virgin help all, especially the young, to follow the path of peace and brotherhood, based on acceptance and forgiveness, on respect for the other and on the love that is the gift of self. May our Mother, bright star of joy and serenity, give to families, shrines of love, the blessing and the joy of life. May Mary, source of every consolation, bring help and comfort to those who are in difficulty. With these intentions, now let us join together in the Angelus prayer.